Peace and Blessings, first we want to apologize for anything unfinished. Abbacasita will be constantly growing and changing as "we" grow and we will be making updates when possible and a monthly new Blog should be there hopefully every first Sunday but that will change to weekly at some point. We have decided to redirect our time to prayer and personal growth (the reason for the little development on pages other than blog) until there are more members. Barbara Rose Centilli's: "Seeing with the Eyes of the Soul"
IT IS ENCOURAGED, AND OF COURSE IF YOU ARE COMFORTABLE DOING SO, TO ADDRESS EACH OTHER BY "brother" & "sister" when we refer to each other by name when replying to one another in the various socializing places at Abbacasita... while it's not possible to really ensure or enforce this, it fosters a loving and respectful atmosphere that continually reminds us that we are such in our One True God & Father. WE ALSO MAINTAIN A TREE OF LIFE environment. Meaning, we aim to focus on the fruits of the Tree of Life as opposed to the fruits of the Tree of Knowledge of Good & Evil. In these messages, Father often redirects Barbara's focus from tragedy... to Himself. Although addressing the effects of sin has it's place, our emphasis here will be the fruits of our redemption from sin IN & WITH our Father, through Jesus our Brother Redeemer and Mary our Mother Co-Redemptrix and our own transformations through grace. I realize this is not perfectly possible, even for myself as you will discover, because we live in a broken world but it is something we can aim for. God forbid, but we reserve the right to delete content and or ban users from forums. And Abbacasita can not be held responsible for any off-site content or copyrighted materials uploaded by users. If you find something offensive has been posted before we spot it, please email us. Hi! 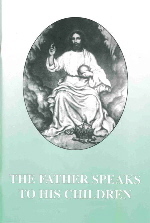 Abbacasita is a gathering of ALL of God's children (not only Catholic Christians) who have benefited from the messages contained in the previously mentioned books. WE AT ABBACASITA ARE NOT AFFILIATED WITH THE PUBLISHERS OF THESE (the 2 above) WORKS OR THE VISIONARIES. We submit to the final authoritative decision of the Roman Catholic Church acting "in persona Cristi" when such a decision is made. "The Father Speaks to His Children" however has approved status. Regarding "Seeing with the Eyes of the Soul", The Church gives us the freedom to read and discern these kinds of works and weigh their fruits as long as there contains no doctrinal errors. And we have the assurance of trusted theologians ( forward is by Fr. Richard Foley ), that this work is free from them. we can't ensure your privacy due to the nature of internet features and so whatever you share will be "internet public", so keep that in mind.